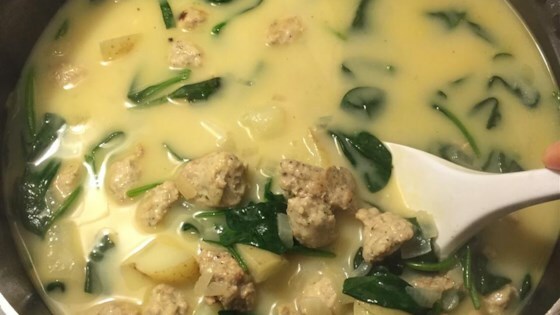 "Tuscan soup with spicy sausages, potatoes, and spinach." A hearty kale soup with white beans, bacon, tomatoes, and cheesy croutons. This soup made a great meal. To make it lower in fat, I used turkey sausage and 98% fat free chicken broth. I also used frozen chopped spinach. Delicious!